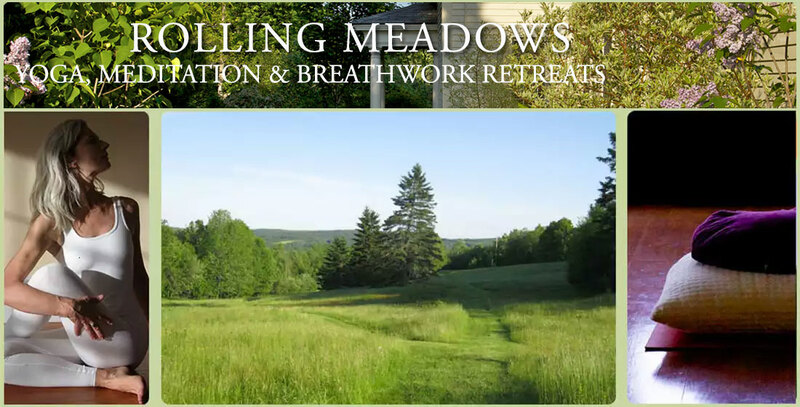 Silent yoga retreats at Rolling Meadows offer a spiritually focused process of transformation for serious practitioners to expand consciousness, self-awareness, and deepen healing at a 100 acre secluded retreat center in the pristine hills of coastal Maine. These retreats are guided by Patricia and Surya, who bring 35 years of teaching experience, which they have integrated from their shared passion for self-transformation. The small group meditation, breathwork and yoga retreats are intimate with space for 11 participants. These silent retreats offer experiential and reflective time with sessions including meditation, classic yoga asana, yin and restorative yoga, movement meditation, yoga nidra, breathwork, psycho-spiritual processes, writing, silence and communing with the natural world. In this supportive environment, away from the demands of daily routines, light is shed on habitual patterns of behavior, time is given to digest life experience, and space open to recognize the ease and peace of our True Nature. Scheduled silent meditation and yoga retreats are offered from May through November in a New England retreat center on 100 acres of walking trails, fields, gardens and a spring-fed pond. The expansive views create a feeling of opennesss while the intimate atmosphere provides a backdrop for turning within. These meditation, breathwork and yoga retreats offer a rare opportunity of shared silence, except during the sessions when questions and discussion may occur. The silent community creates a supportive environment for opening to inner silence, allowing the body and mind to quiet while being aware of conditioned beliefs and the ever available presence of our True Nature. USA Today, Boston.com, Travel & Leisure.com, Time Out.com, NerdWallet.com and Outside Magazine have rated Rolling Meadows Retreat one of the top ten places to take a retreat. Retreats are available on scheduled dates only which are listed on our calendar page here. The retreat I took last year completely changed my life. I learned invaluable lessons of acceptance, love, and peace. After struggling for a very long time, I finally felt understanding. Many people have asked where the shift originated, and I always pinpoint it at your retreat. I am so grateful for the time i spent at Rolling Meadows. For a page with information on “Why take a Retreat” click here. For a page with information on Silent Retreat click here. Please note that retreats are offered only on the dates listed on the Calendar Page. To receive occasional (4 or 5 times a year) e-mail notices of scheduled events please go to this page.